I received a parcel today from my dear friend in Germany. 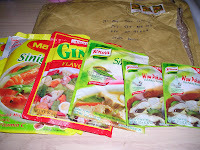 Thanks a lot Mads Fe for these cooking mixes, mapapasarap na naman luto ko nito hehehe. I hope that you will be able to fix your computer problem so we'll have a chance to chat again. me and malou are missing you! 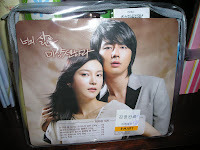 ~~~~~~~~~~~~~~~~~~~~~~~~~~~~~~~~~~~ I also receive a late Chusok present from my Korean student yesterday. Kamsa hamnida Min Young! I am thanking the Lord Almighty for giving me friends everywhere I go. I find it very amusing when my two kids are trying to mimic us. They try to copy everything that we do and say. Its pretty flattering for the parents when they see their children trying to be big by imitating their actions. SO rewarding too! What more can I say, I was blessed with two precious angels! Here are some photos of my two lil' ones wearing our shoes. Aren't they cute?